[Solved] How to do proper map transition? Discussion in 'RPG Maker MV' started by BurningOrca, Apr 15, 2019 at 1:42 PM. map transition event is located. correct directional key afterwards, nothing happens. located at the exact same position of the event and presses the direction where the next map is located? Is this even the right subforum to ask this question? No, it's not the right forum. "How do I ...?" (Implementation questions) belong in the Support forum for the engine you are using. 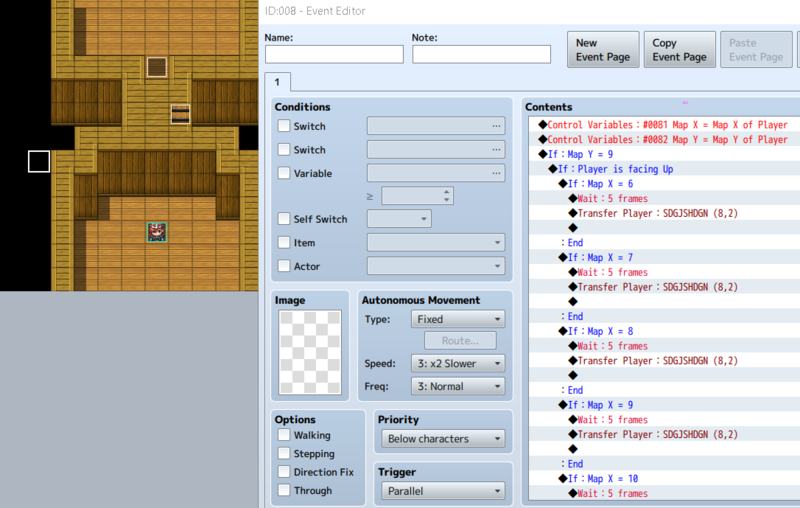 I've moved this thread to RPGMaker MV. Please be sure to post your threads in the correct forum next time. Thank you. Please post a screenshot of the event. the immediate solution i can think of, is transporting to a space away from the event, like this. . .
caethyril and BurningOrca like this. Sorry screenshot is german, the event conditions are "Player touch" and "Below Player". The If Condition is "Player faces up". And on the other map it is the same, but "Player faces down". Yes, but then if have to recreate my entire maps to contain the last row of tiles from the previous maps. Maybe I do that, as this seems to be the simplest solution. The "proper" method is using the automated build-in event creation for transfer or door. I strongly suggest you use the right-click "quick event" option to create a transfer event instead of doing it manually as that will show you how it is done correctly and be much less work than creating manual events with multiple commands and conditional branches in them. I walk onto the neighbour transition event by pressing left on the new map I get immediately transferred, back. I do not want this, because I am not facing in the direction the previous map is located. So Calluses suggestions seems currently to be the best solution. @BurningOrca No, there is a simpler way. You can set the direction the player will end up in after transfer. This is the only way I can think of doing it. Another way would be to make it so the event constantly interacts with anything touching it, but I'm not sure how to do that. Keep in mind, for some reason, the parallel event processes player touch much faster, so making it wait 5 frames or something like that might be a good idea. I hope this helps! player facing condition in the event, I even cannot walk onto the event anymore. but I thought I have to make it run a script that does this. I will try out your solution Callusses. Your problem is that you want to end up on the same place as the transfer-back-event. 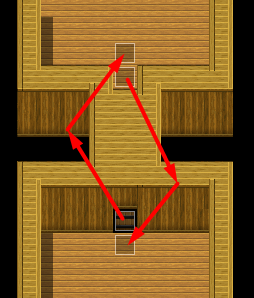 But the engine was written on the assumption that the player would be transported to the next position into the map, and the way the events react is programmed on that. Events only trigger on entering their map position, NOT when the player is already standing on them. That fact has nothing to do with transfers, it is true for all events - your use of the transfer command just forces a bypass on the event by placing you on the event itself. The regular transfer events will automatically work if you target the position above them in your example, they will never work as intended if you transfer the player on top of one such transfer event. The parallel event works thank you. @Andar: Yes I did understand that, I was just searching for a way to work around that while keeping the transfer locations at outmost tiles of my maps where the transfer back events are located and the parallel transfer events solved this issue. It works even better if I disable touch input via Yanflys Plugin just for the map. The only thing is, I miss touch input because it was really fast and I got used to it, but dashing speed is okay for me, too.